Heading into one of the more exciting weekends of the summer, today we kicked off our 15th Annual Kingfisher Derby and it’s the biggest ever! Sixty-four anglers are vying for $128000 in prize money. This is a catch & release derby where all Chinook salmon entered are officially scored, revived and released by derby weighmasters. The 3-day event concludes on Sunday at 7:00 pm when the prizes will be awarded for the three largest salmon released, plus daily winners and a single $10000 prize for the largest killed fish. Stay tuned for the results! 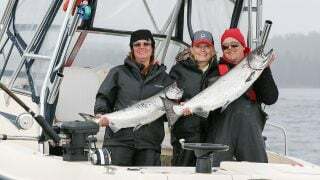 The past few days have been consistent with last week’s fishery – lots of feisty feeder springs in the 130-foot line offshore and the occasional larger fish showing up in the mix. 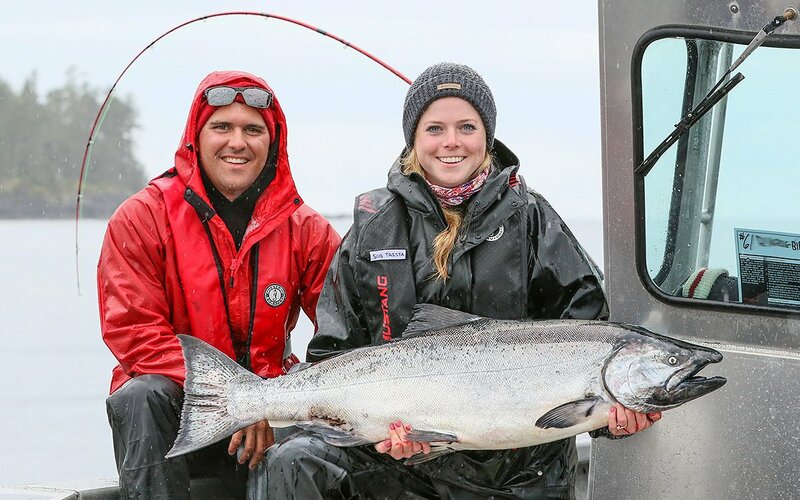 The big fish this week was a stunning 36-pounder for first timer Trista B – a particularly good omen in this instance as Trista answered her boyfriend Andrew’s proposal with a resounding YES! It’s truly a celebration Tyee! Congratulations! 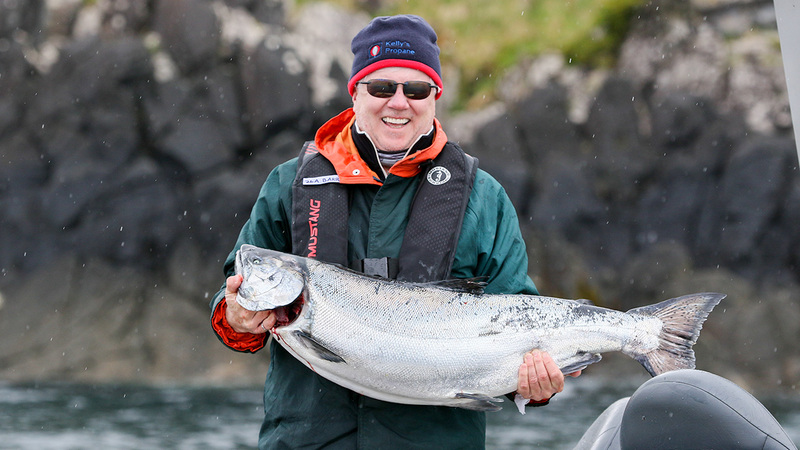 Our halibut fishery continues to be especially rewarding, whether you’re seeking some perfect “chickens and turkeys” for the table or you love the challenge of finding “Wally” the barn door out there. 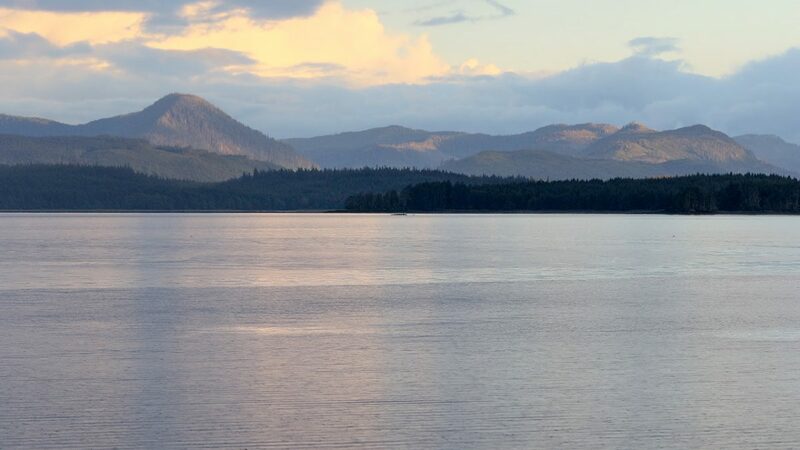 We’ve got it all in that department… the waters of Virago Sound provide lots of perfect structure for halibut and other groundfish. Several big keepers kept the Bell Ringin’ each evening. Joining the venerable 100-Pounder Club this week were Kevin C who managed to haul up a 110 and a 120-pound halibut! Brad H released a 148, Mike N battled a 122 pounder to the top and David C called up some real grit to raise a monster alongside the boat that taped out to 76 inches in length for a calculated weight of 234 pounds! It’s often amazing to go jigging because you just never know what you might hook up with down there. Well done David and Congratulations to you and your guide Jeevan for such an awesome achievement!